Following in the footsteps of many birders before us, Aimee and I made the pilgrimage to Serra das Araras to see the famous nesting site of the Harpy Eagle. This well-known eyrie has produced magnificent Harpy Eagle observations, and photographs, for several decades, although it’s still far from being a popular tourist attraction. A few hours’ drive from Cuiaba in the state of Mato Grosso, Pousada Currupira das Araras serves as the base for this relatively easy excursion, requiring only a few hundred meter’s walk and a little patience. Similar to our experience in Chapada dos Guimaraes, I had to scramble to arrange our brief visit, which coincided with the Christmas holiday when the pousada is unfortunately closed like many lodges, inns, and hotels in Brazil’s best ecotourism destinations. Geographically and ecologically, Serra das Araras is a fascinating region, as it’s an assortment of spectacular plateaus surrounded by humid forest as well as savanna, boasting an avifauna that’s as much Amazonia as Cerrado. While cattle ranching and mining have contributed to extensive environmental degradation, the pousada itself is certainly located in an attractive setting. This patchwork of different ecosystems, both natural and manmade, creates a dynamic environment for birding, where it’s possible to see Greater Ema, Wattled Jacana, Toco Toucan, Sharpbill, and Harpy Eagle from nearly the same spot. Birders could happily spend several days exploring the area, although the price of staying at the pousada is not insignificant (R$355 per night for two people). Regular day visits (R$100 per person) can also be arranged that include a guide and as well as lunch (contact Ricardo at (65) 3321–1066 or Maria Teresa at pousadacurrupira@yahoo.com.br). Staying the night in Cuiaba at Hotel Portal da Amazonia (R$118 for a double room), Aimee and I left in our rental car well before dawn, not knowing what to expect about the potential of actually seeing a Harpy Eagle. 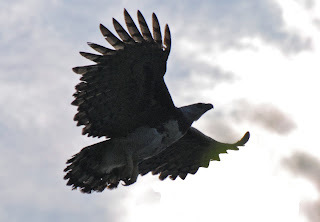 I had heard from several birding tour companies that the eagles will likely be nesting in 2012, and the contacts at the lodge both confirmed that they had been seen around the nest recently. To increase our chances, I figured that it would be best to get there as early as possible, especially considering how difficult it is to navigate Cuiaba and the neighboring city of Varzea Grande, as there are few signs on the road and several surprising one-way streets. Once we finally escaped the city, it was a beautiful drive through transitional Cerrado and Pantanal habitat, albeit both degraded by cattle ranching, and I listed to Baden Powell’s melancholic guitar playing on the stereo to calm my nerves. It would also be possible to stay in Jangada for the night, where there was at least one decent hotel, if you wanted to arrive on site closer to dawn. 35 km from the turnoff to Barra de Bugres, there’s a sign indicating the dirt road to Pousada Currupira das Araras, which you’ll eventually arrive at after passing through the gated property of a mining company. We were greeted at the pousada and put in the care of a young farm worker who helped us navigate the track towards the eyrie through several clearings and past hundreds of cattle. I started getting very excited as we put on our rubber boots and finally left the car behind, mistakenly shouting “Harpy Eagle!” at first site of a Crane Hawk that dove out of the crown of a nearby tree. If it’s not already apparent, the nesting area is sadly degraded, with cleared areas on all sides of the towering tree that the nest is located in (this does, of course, create better viewing opportunities). I imagine the eagles certainly mind the environmental destruction, although they appear creatures of habit, returning to repair and use the same nest every few years regardless of the changes to the surrounding forest. We first noted the female from a distance, her hulking silhouette visible on top of the giant nest, which is easily as big as a Volkswagen Gol and positioned in the main crook of the tree. I’ve heard that Harpy Eagles are undisturbed by the presence of humans and imperially nonchalant in their behavior, but the female was clearly aware of us as we set up the scope from what I judged to be a respectable distance. After marveling for a while in awe, I moved the scope to a better vantage point and was shocked to see the male sitting out in the open in the same tree. Considerably smaller than the female, the male was also agitated by our presence and swooped magnificently into another tree nearby, where he remained in better cover. Seeing a Harpy Eagle spread its enormous wings and glide overhead is a breathtaking experience, and I couldn’t help but glance protectively at Aimee to see if she was still by my side. Indeed, the eagle is arguably the most powerful bird of prey in the world and regularly snatches monkeys and sloths from trees, as well as taking down brocket deer on the forest floor. The female soon joined the male in the neighboring tree, again taking to the air on enormous wings, its huge talons dangling menacingly in flight. For the next hour, we soaked up the eagles, enjoying excellent viewing conditions, even if the photographic conditions could have been better. I tried digiscoping as well as using my own telephoto lens, but ultimately I needed more glass and a better camera to really do the eagles justice (I’m still using a Nikon D-80 but hoping to upgrade to a D-5100 next year). Who could complain, though? After six years of birding in the neotropics I was finally observing the Harpy Eagle, both a male and female, at length, and in good company. Amazingly enough, Aimee and I actually decided to walk away from the birds too, as we were clearly disturbing them as they frequently raised their crown feathers and glared in our direction. Perhaps we were too close, or maybe they really were in the process of mating and nesting. At any rate, we’ll be visiting Cristalino Lodge in February, and there’s a good chance we’ll see another Harpy Eagle at a nesting site in Alta Floresta on the property of the Floresta Amazonica Hotel, which I understand is also supposed to be active in 2012. We spent a few more hours birding a road that leads past the pousada towards another fazenda. I was hoping to get on a forest trail and search for Sharpbill, but it wasn’t clear whether there were actually any accessible trails or whether I simply wasn’t allowed on them unaccompanied. From the road we had a few more noteworthy observations, including White-Tailed Hawk in a bare tree in a clearing, Gray Hawk, Great Antshrike, Lettered Aracari, and Lesser Yellow-Headed Vultures. Yellow-Tufted Woodpecker, Thrush-Like Wren, Yellow-Rumped Cacique, and Purplish Jay were common. Most interesting was a massive dark gray raptor soaring overhead that seemed to appear out of nowhere. It glided down from the towering plateau nearby, with surprisingly broad wings and very long primary feathers, its yellow legs clearly visible. I only had a few seconds to take it all in, as the bird plunged behind the forest near the road, perhaps landing in a tree or clearing, but I wouldn’t be surprised if it was a Crowned Solitary Eagle. Brazilian bird guide Paulo Boute knows the area well and has seen Crowned Solitary Eagle there on several occasions. Imagine seeing both the Harpy and Crowned Solitary Eagle in the same day. Notable birds seen: Greater Rhea, White-Faced Whistling-Duck, Least Grebe, Striated Heron, Whistling Heron, Lesser Yellow-Headed Vulture, Plumbeous Kite, Crane Hawk, Gray Hawk, White-Tailed Hawk, Harpy Eagle, Common Moorhen, Wattled Jacana, Yellow-Chevroned Parakeet, Amazon Kingfisher, Lettered Aracari, Toco Toucan, Green-Barred Woodpecker, Yellow-Tufted Woodpecker, Great Antshrike, Streaked Flycatcher, Purplish Jay, Thrush-Like Wren, Grayish Saltator, Yellow-Rumped Cacique. Agradecemos a força que tem dado a Pousada, através do seu blog. De nada, amigos. Lembra-se que voces nos acomodaram durante os dias de folga. Muito obrigado pela experiencia inesquecivel!